The Adams Rite Steel Hawk 4300 Electrified Deadlatch (eLatch) combines non-handed, narrow backset, mechanical locking hardware with electrified access control for aluminum stile doors. 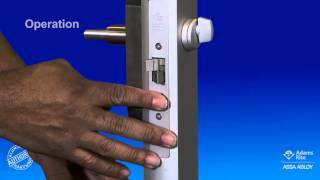 The 4300 eLatch combines mechanical locking hardware with electrified access control. Always operable from the inside via handle or paddle device. Entry via keyed mortise cylinder or access control device. Interchangeable without stile modification for MS Deadlocks or 4500 and 4900 Deadlatches. 1-3/4" minimum door thickness required. Operates on 12, or 24 volt DC power and is rated for continuous duty. Field selectable . Fail-secure-electric strikes require power to be applied to unlock the strike lip. In the case of a power loss, the strike will be locked. Latchbolt, 5/8" x 1" x 5/8" throw. Stainless steel. Case,15/16" x 5-13/16" x depth. Depth varies by backset by backset. Faceplates, 1" x 6-7/8", with flat and radius faceplates, strike, and machine screws for mounting. Strike, 4-5/8" mortised-flush for flat/standard jamb, covering existing MS® deadlock preparation or for new applications. Units are equipped with a quick connect plug-in type connector. Supplied with universal cam plug 4581 to work with specified handles or paddle operators. Cylinder, paddle or handle available separately. Adams Rite 4591 Deadlatch Paddle for Use with 4500/4900 Deadlatches.